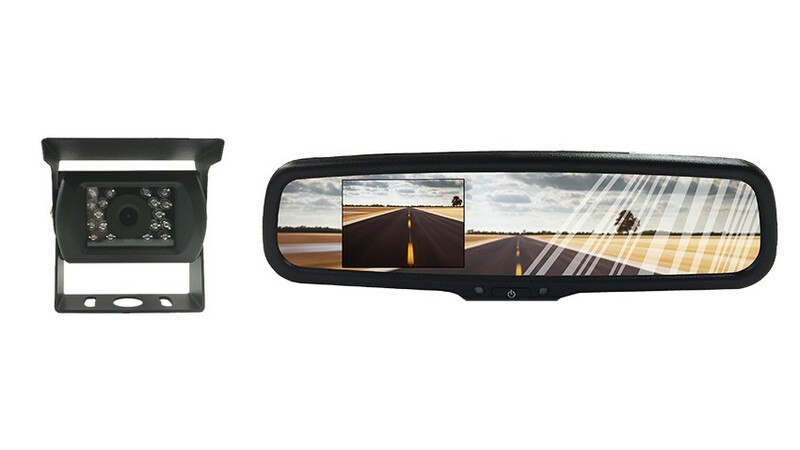 This 4.3 Inch full Mirror replacement monitor is the perfect screen for anyone who wants the clean look of a mirror in a truck or RV but have the benefit of an LCD screen with the best backup camera on the market. This monitor boasts a 4.3 in full color screen with 2 inputs, the LCD sits in a standard size mirror shell so you can see the backup camera and it is covered by a special glass that that look like a regular mirror when your LCD screen is not being used. It is important to mention that the 4.3 inch LCD portion of the mirror only takes up a third of the mirror area so even while using the backup camera there is plenty of mirror available to see what is directly behind you. This monitor also includes a compass and a temperature display, most people that will sit in the vehicle would have a hard time even knowing that it didn’t come stock in the vehicle. The last feature this monitor has is the 2 inputs. This can be used for adding a second camera. For example; you can mount the box camera on the back of your 5th wheel and 2nd camera on the back of your truck for help while you’re hitching up. Some people simply use it to watch what their driving when they’re not pulling anything. The camera arm includes multiple adapters that will make it fit to any type of vehicle and if you don’t have a mirror there now it comes with the full mirror attachment. We have every adapter for every make of vehicle so we guarantee it will fit your truck or any other car. Remember, this mirror takes the place of the original mirror rather than clamping on like our other mirrors. The mirror also has an auto dimming feature. When installing the mirror fits right onto the spot your current mirrors fits.